“Thanks for the genetic testing results, but what do they MEAN?! !” could be the unifying cry of thousands of patients and family members after receiving genetic test results that show they have a genetic change known as a “variant of uncertain significance” or “variant of unknown significance.” Usually called a VUS or VOUS, this is the very expected result of advanced genetic testing technologies colliding with our complex and unique human genetic code. Today’s featured unsung heroes are the people working hard to explain and understand a VUS: I call them Variant Detectives. Many Variant Detectives are genetic counselors, medical geneticists, and other healthcare professionals. Hand in hand with these healthcare detectives are the Variant Detectives working in diagnostic genetic testing laboratories. These detectives intensively search genomic databases like ClinVar, scour published genetic sequencing reports in the scientific literature, use predictive models of how genes with a VUS may act in the body, and explore other genomic avenues – all to learn practical health information for the families who have them. They’re trying figure out what the VUS means (and what it doesn’t). However, not just medical and laboratory professionals are Variant Detectives. Patients, family members, and advocacy groups also are trying to figure out the meaning of their personal genetic VUS. The overarching goal for all these Variant Detectives is to solve the mysteries of the wishy-washy VUS and bring knowledge and empowerment to people receiving the results. Could you use the help of a Variant Detective? 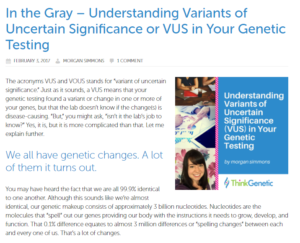 Generally, the first clue that you could benefit from working with a Variant Detective is that you have had genetic testing, looking for a cause or prediction of health issues, and the results show you have at least one VUS. (You can read more about what that means in a great ThinkGenetic article by Morgan Simmons, genetic counselor, here). Thanks to the Human Genome project, which harnessed the power of countless labs full of genetic scientists, lab techs, and other highly trained genetics professionals, we have a general theory on how genes should be “spelled” or what order the base pairs that make up our DNA should be in. However, human genes are spelled slightly differently based on the way a person’s gene sources (such as race, ethnicity, and ancestral location) have mixed together to form a genetic code or genome. Some of your unique gene changes are just slight differences in spelling and not expected to cause any issues with how your body works. We call those polymorphisms. (You can read more about what that means in another excellent ThinkGenetic article by Morgan Simmons here). 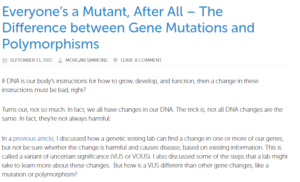 Lurking between harmless polymorphisms and harmful variants are the VUS – these are the genetic changes we don’t have enough information about to know where they stand. You will find a VUS (or more than one) ducking its head and sheepishly fidgeting in many genetic test reports. That is the land of the VUS. The land of, “We don’t know… yet.” The land of, “We’ve only seen it in you and your family.” It is a deceptively vast land that grows with every genetic test completed. So, what do you do if you have a VUS? First, talk to a Variant Detective! In many cases, that’s a genetic counselor. If you don’t have one, ask for a referral to see one from your healthcare provider. If you’re in the U.S., you can find one by searching the “Find a Genetic Counselor” website by the National Society of Genetic Counselors. If you’re in Canada, you can search the Canadian Association of Genetic Counsellors website for a local genetics clinic. Be your own Variant Detective! In addition to working with a genetic counselor, there are other patient and family-focused projects that can help you be your own Variant Detective. 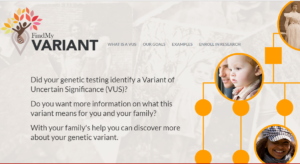 These include the University of Washington’s “Find My Variant” project that works directly with individuals with a VUS to identify and collect DNA samples from their family members to learn more about their VUS. 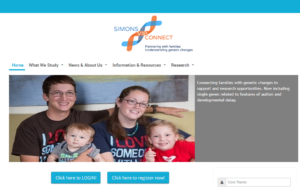 For children with developmental delays, there are projects like the “Simons Variation in Individuals Project” (Simons VIP), an online community that supports families with rare genetic changes associated with features of autism spectrum disorder and developmental delay. 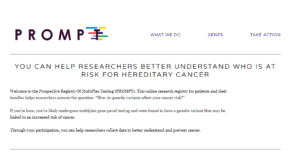 For those with a VUS resulting from hereditary cancer multi-gene panel testing, a patient-focused centralized database called PROMPT gathers information to provide critical data to promote scientific discoveries and deeper understanding of cancer susceptibility genes. 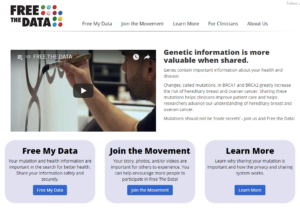 For those with a VUS in a gene related to hereditary breast and ovarian cancer susceptibility, such as the BRCA1 or BRCA2 genes, there is the “Free the Data” project. These are just a sampling of the patient/family projects focused on clarifying the impact of VUS in a specific gene or condition, making us all Variant Detectives. Following hard work from all Variant Detectives, over time the labs performing the genetic testing can share their patient and family data with other labs to gather enough information to push that VUS into either the benign polymorphism or deleterious variant categories. In some situations, genetic counselors, doctors, and patients may receive a new and updated lab report. In other situations, doctors and genetic counselors may need to call and check with the lab from time to time to see if more information is available and the lab may be able to issue an updated genetic report that has reclassified the VUS. Families can contact their doctor or genetic counselor for updates, too. What a lot of work! So today I’d like to pull the Variant Detectives out of their researching for a minute and into the light of day so we can all say THANK YOU! Thank you for tackling the unknown to try and tame the wild genetic code. Thank you for every test result that could have been a VUS, but instead has a definitive answer. And most of all, thank you for helping patients and families feel educated and empowered. Thank you for recognizing not only the genetic counselors, medical geneticists, and other healthcare professionals that work hard to understand a VUS result but the patients, family members, and advocacy groups too! 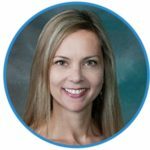 I also think Karmen Trzuzpek is right on when she mentions “patients frequently tell me that prior to their genetic counseling appointment, reading their test report was like trying to read a foreign language.” Keep up the great work!